The Arrival of Spring in Woldgate, East Yorkshire in 2011; iPad drawing printed on paper. 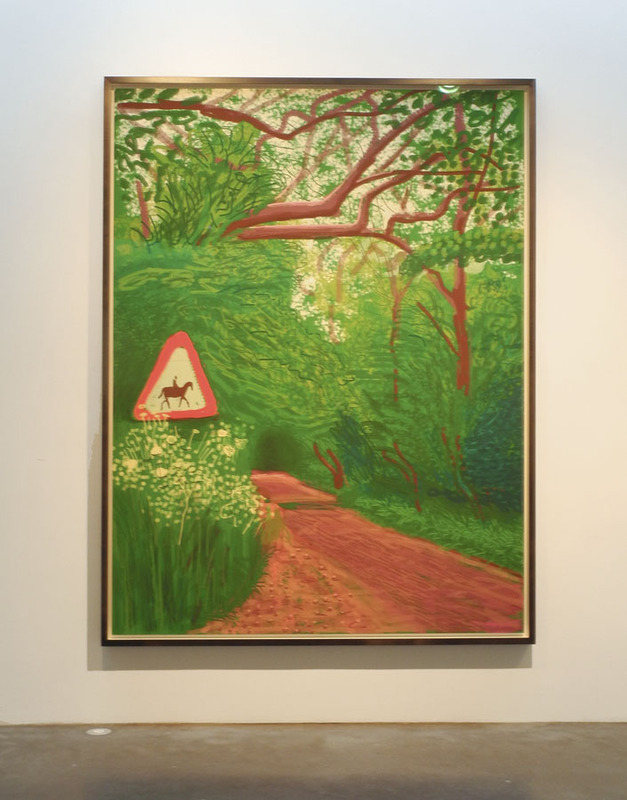 David Hockney is something of a magician: he can take mundane, even clichéd subject matter––a road disappearing in the distance, surrounded by trees (I would have insisted that my painting students stay away from that central road)––and turn it into a vivid and playful image. 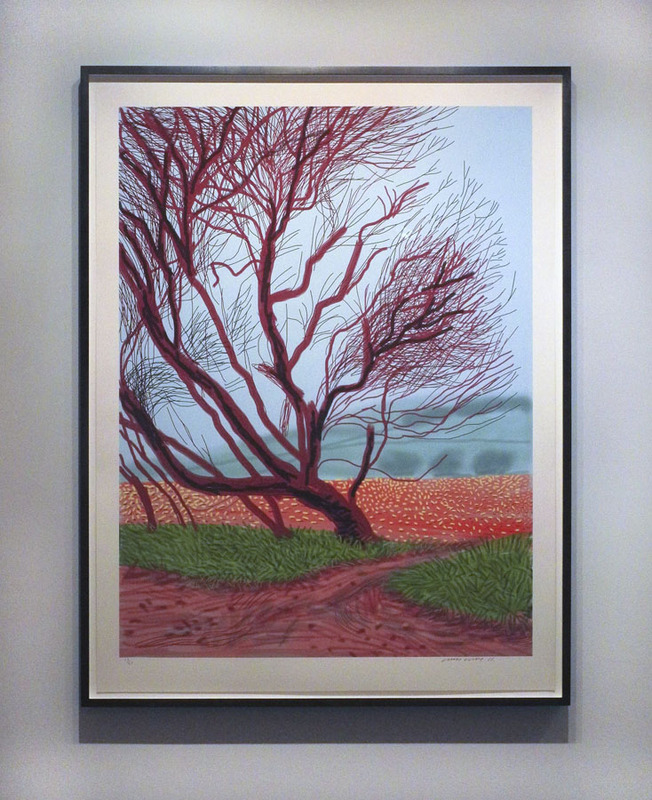 When I first walked into the rooms of prints in Hockney's show at Pace Gallery titled "The Arrival of Spring" I nearly groaned––flowers, trees, that darn road––but the longer I looked, the more I was seduced by the Hockney's project to picture the arrival of spring in Yorkshire through iPad drawings. There is a directness and wonder in these works that is quite engaging. 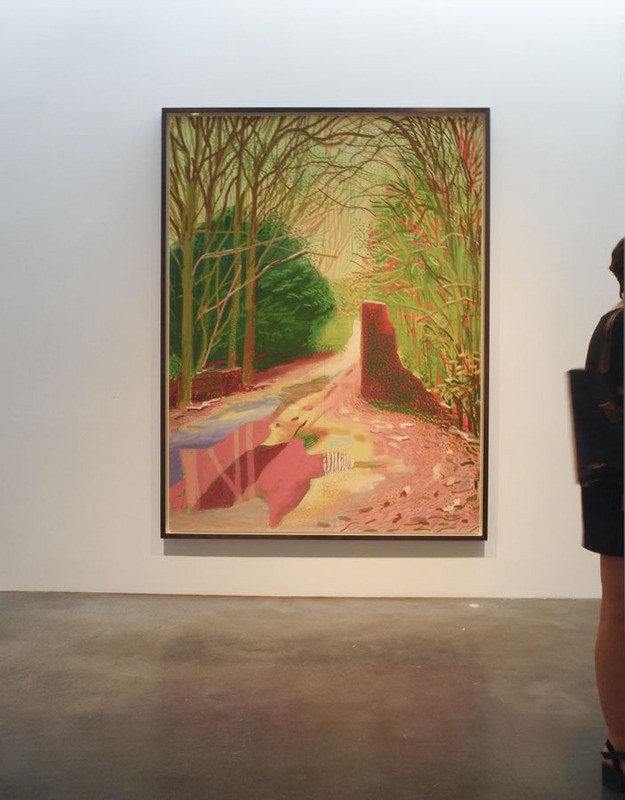 Hockney's paintings of landscape are also delightful. I see a similarity with Alex Katz's landscapes in their poetic approach to mundane subjects, with a primacy of color and gesture. We see the remnants of winter and the slow movement towards spring as leaves and flowers emerge. I love the rhythm of this leaning tree as it moves from trunk to branch to wavering twig. The tree is an overall red, a color I see here in Vermont as trees begin to wake up from winter and their buds swell. 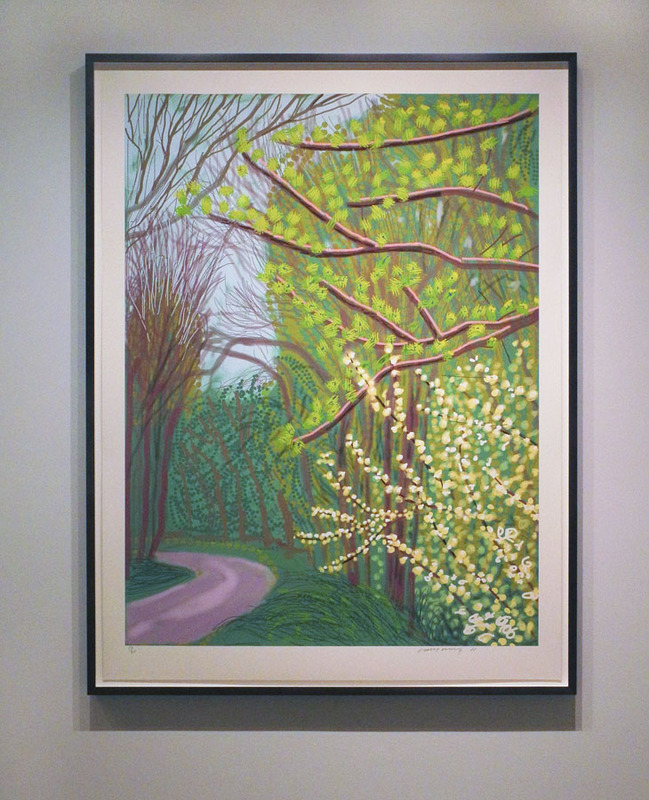 Hockney captures the early haze of pale green new leaves, the green of trunks covered with mosses and lichens. I'm sorry not to have the exact titles and sizes for the work I photographed; each is dated and the prints are large at 55 inches high, with a couple of them bigger. I got an iPad when they first came out in June 2010. I had been drawing on the iPhone for about a year, so when I got round to starting the arrival os spring, I had been making iPad drawings for six months. These were drawing knowing they would be printed a certain size. The mark making is very varied for this reason. What I drew was the arrival of Spring in Woldgate in 2011. This takes a month or more. There is not much to the end of April, and the arrival of the Queen Ann's Lace and the Blackthorn and Hawthorn arrive near the end of May. Ahh, the plip-plop, splish-splash of rain on a dirt road puddle, its warm brown an interesting complement to the tree in pink bud. 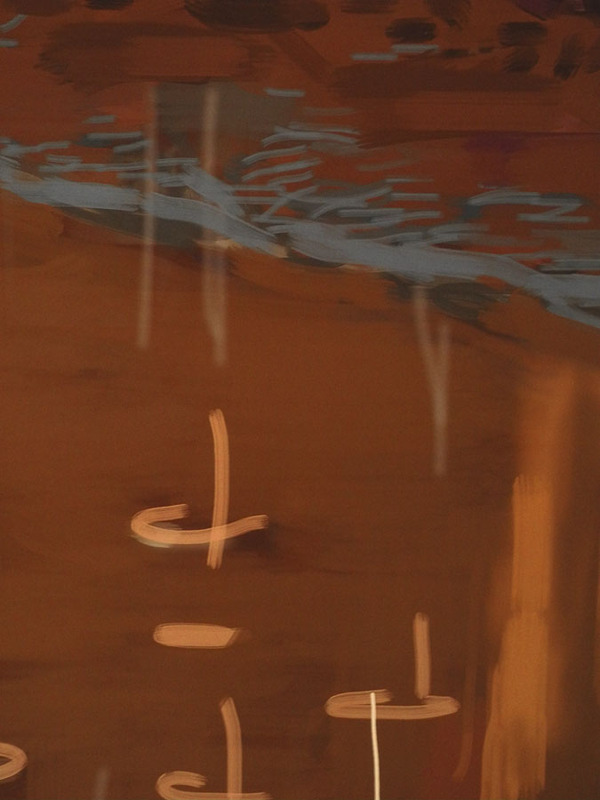 In this detail of the rain print, you can get some sense of the fluid marks used to produce the image. There's a layering of color, possibly erasure to get the water droplets. In another detail (my photo of the entire print was out of focus; why didn't I take several?) different kinds of marks are evident, from the energetic squiggles used to depict a flowering tree, to the soft dots of the background. 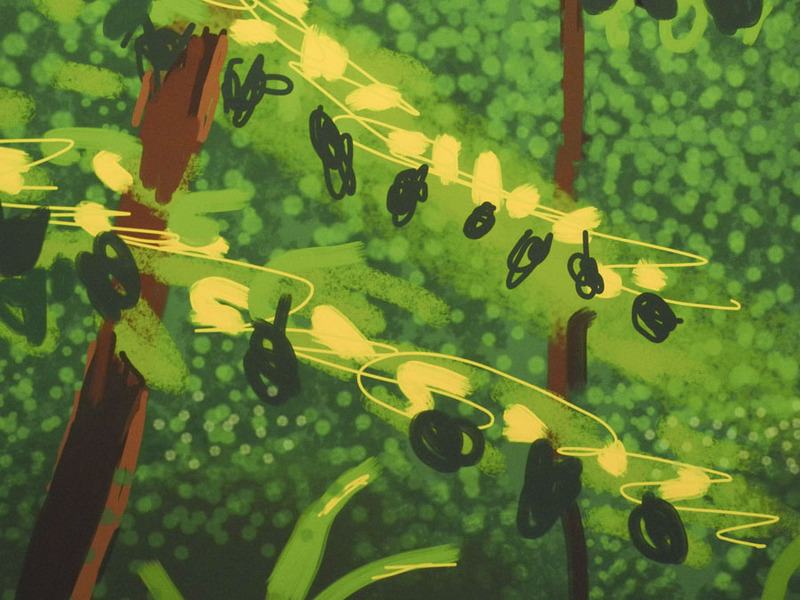 I also wish I'd taken more detail shots because it's here that we can see how fresh and alive Hockney's marks are; they seem almost silly, but I know how difficult the seemingly simple can be. Please enlarge the images by clicking so that you can see the racing lines, the blobs and squiggles that go to make up these prints. Dots of pale green and of white: new leaves and blossoms. But spring has not fully arrived; with the green are still some bare trees alongside the purple road. Spring is here in earnest, green green green, decorated with the fluffy white of Queen Anne's Lace, and a road sign echoing the shape of the road. 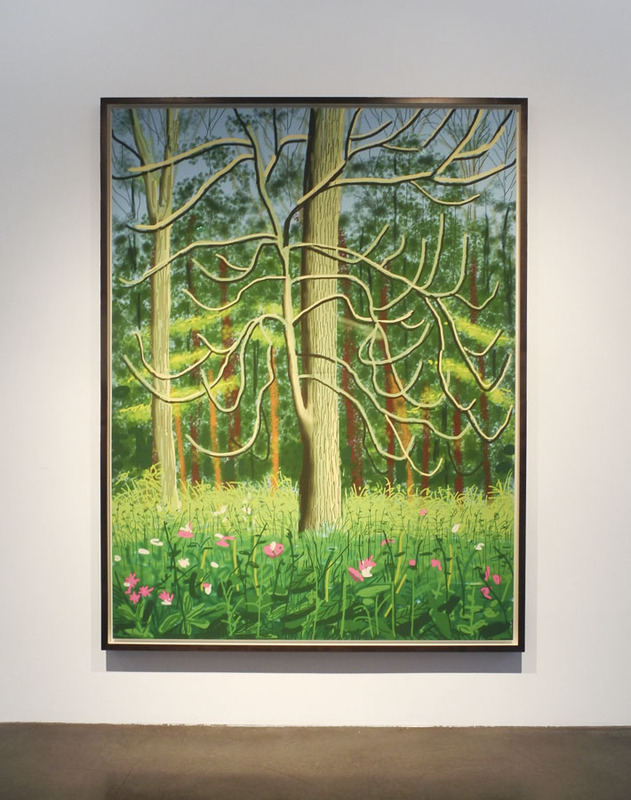 In this, and all the prints in the show, I see Hockney's love of his place in the world; I feel the interest and excitement he brought to his drawing, and the skill; I sense the thrill of the new medium. His vision is an ordinary one, but through it the everyday is transformed. 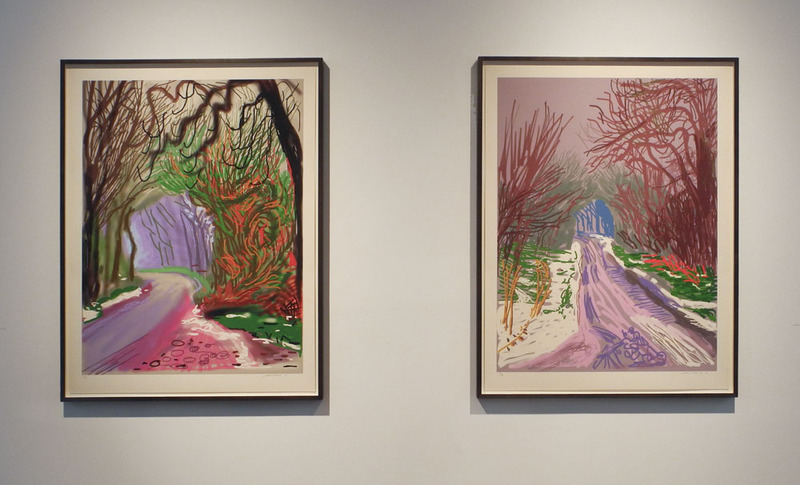 I'm smitten with Hockney's latest landscapes, and the iPad drawings do not disappoint. Such a brilliant orchestration of contrasts and so utterly life-like in the midst of all the simplifications. Just wonderful. A painter who has engaged me my entire life. Thanks, Julie and Valerianna, for your comments. 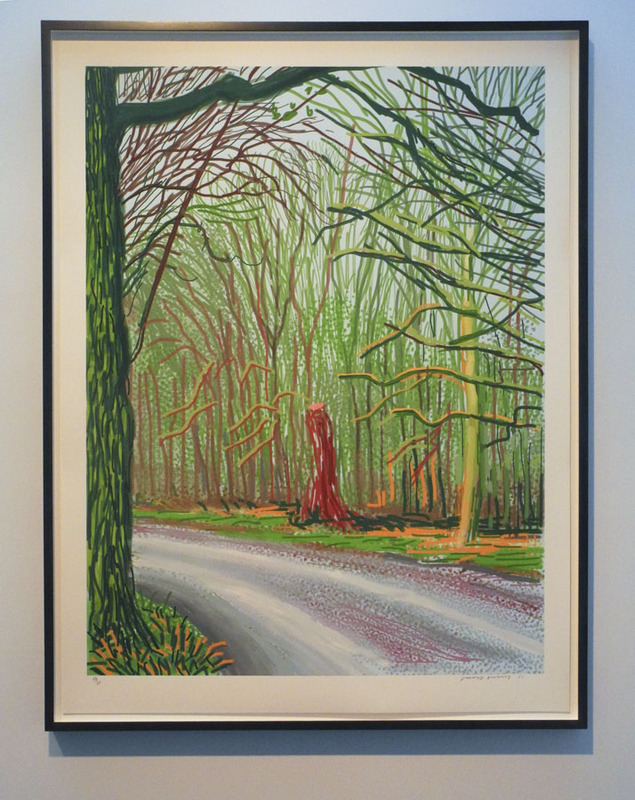 Hockney has been a disarming artist for years and years, but I agree that the recent landscapes are marvelous. Exciting stuff, thoughtfully presented. Thank you. thanks, JBS, and you're very welcome. I love the way you've written about this work, Altoon, and thank you for the post and for reminding me of the experience of being there. The iPad prints are delightful -- but I also felt a little prickly about the road and prosaic selection of that view and its place, its emergence, in the composition -- seemingly naive, but from an artist of real sophistication, so that it might seem either disingenuous or lazy. Still, they impressed me; the whole show did, with the charcoal drawings as well. I think I have never respected him more than now. Thank you, Ravenna. I'm glad you also felt a little "prickly" over the work.But there's a real sensibility at work here, which wins us over. 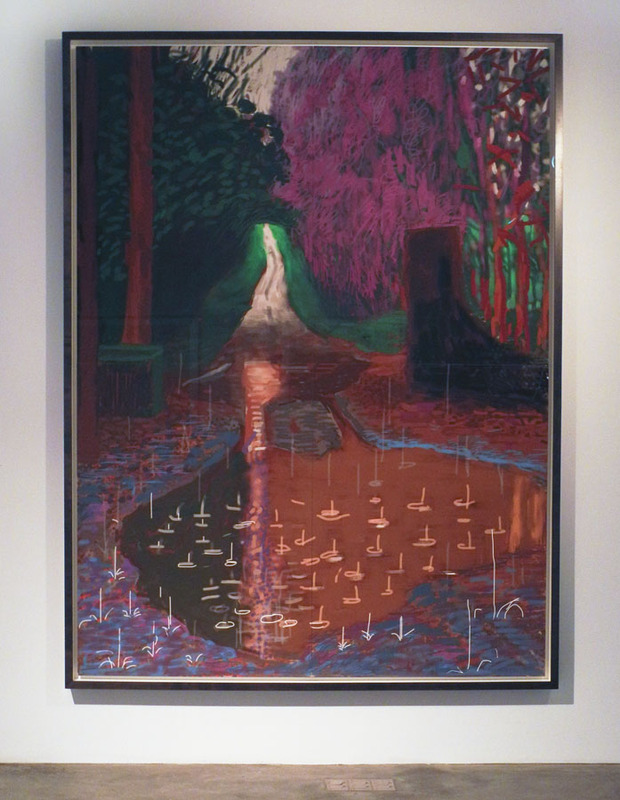 I admire Hockney's work very much. To be truthful, I went to see the iPad drawings fully expecting to dislike them. I was surprised. I loved them. Your description of the work is spot-on. Thank you for sharing. Thanks, donald; I'm so pleased that you thought my writing was "spot-on". A New Boxed Paintings: "Reds"
A New Painting: "Red Arc"